The Amish Shelby Shaker Extend-A-Bench offers gorgeous solid wood seating. Defined by its shaker style, the legs are tapered and the form is simple. This wood bench comes with extensions that bring this bench to a full 96" with all extensions in. Extensions store in their own handy wooden storage box. 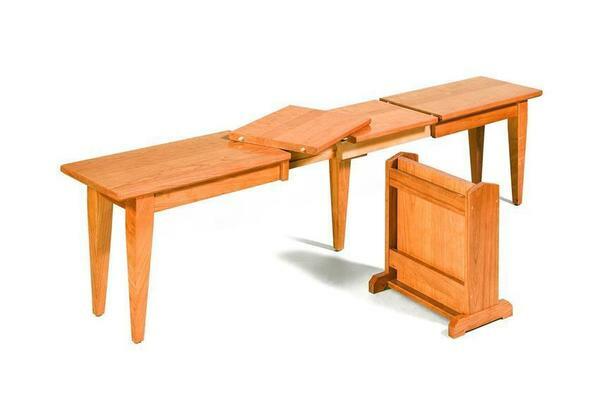 The Amish Shelby Shaker Extend-A-Bench is shown here in cherry wood with chilton toner stain. Measures 13" wide, 18" high and standard length is 48"
Comes with extensions that store in wood box--extensions bring bench to a full 96"
The Amish Shelby Shaker Extend-A-Bench is Amish made in Northern Indiana by leaders in the field. Every detail is carefully considered, creating an heirloom quality bench that will be around for decades. Our Amish Furniture Specialists are available to answer any questions and help with customizations. Please email or call us today. Thank you for taking time to visit DutchCrafters.